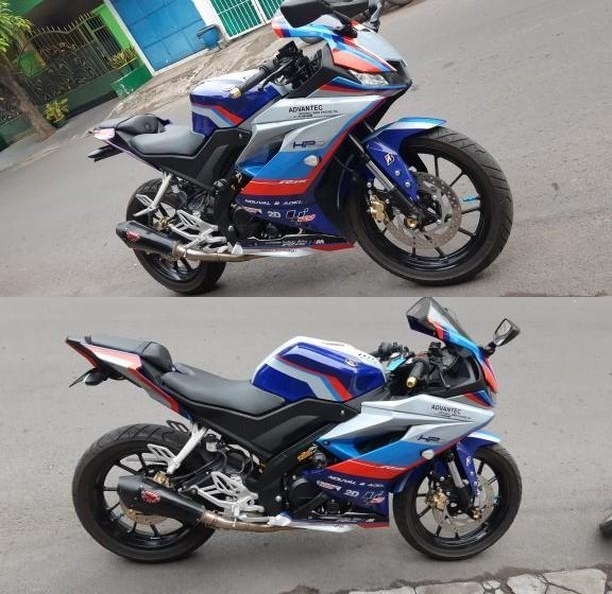 A Yamaha YZF-R15 V3.0 owner from Indonesia took inspiration from a rendered image and created custom decals that draw styling cues from BMW's safety bike, the S1000rr, in MotoGP. The result is an uber-cool Yamaha YZF-R15 V3.0 that looks like none other. The comprehensive decal set offers the unique look to the complete bodywork including the front fender, fascia, fairing, fuel tank and the rear panel. The R15 also gets the decals of the sponsors that are seen on the MotoGP safety bike. The Yamaha YZF-R15 draws styling cues from a render that was inspired by the MotoGP safety bike, the BMW S1000RR. The original blue colour still dominates the paint scheme to avoid getting into trouble with the cops. The owner had initially planned to go for the AGV VR46 helmet theme (image in the gallery below) for her bike. But she later changed her mind and opted for the MotoGP safety bike inspired livery that looked more appealing on the R15. Apart from the custom livery, the motorcycle features an aftermarket exhaust and a rear-fender eliminator that lends a cleaner and compact look to the rear. The rest of the motorcycle continues to feature stock body panels and hardware that include full LED, split-style headlight and upside down telescopic forks among others. The source does not mention any upgrades to the performance of the motorcycle. The aftermarket exhaust may have resulted in a marginal bump in the power output but the exact numbers are not available. For reference, the stock Yamaha YZF-R15 V3.0 uses a 155 cc, liquid-cooled, single-cylinder engine that delivers 19.3 PS of maximum power at 10,000 rpm and 14.7 Nm of peak torque at 8,500 rpm. The motorcycle features first-in-segment variable valve actuation (VVA) technology that is claimed to offer good mid- and top-end power without compromising on either. Yamaha offers a MotoGP edition of the YZF-R15 V3.0 that is available internationally and even in the Indian market. The MotoGP Edition model costs INR 1.30 lakh (ex-showroom Delhi). 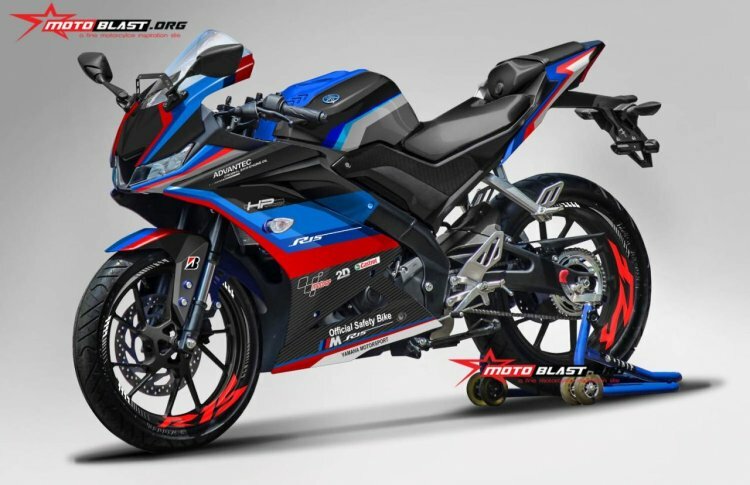 The rendered motorcycle from Motoblast was imagined in four colour options. All the renders are listed in the image gallery at the end of this post. Do you want to see your customised motorcycle on one of the biggest motoring portals in the country? Send us an email at suvil@indianautosblog.com, and if it is appealing enough, we will feature it on our website!